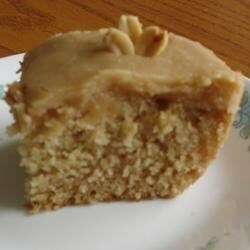 "Get nostalgic with this recipe for peanut butter cake featuring a simple frosting." Preheat oven to 350 degrees F (175 degrees C). Grease and flour a 9x13 inch cake pan. Cream together 1/2 cup butter and 1/2 cup peanut butter. Stir in white and brown sugars and beat well, then add the beaten eggs and 3/4 teaspoon of vanilla. Sift together flour, baking powder and salt. Add the flour mixture into the batter alternately with the milk. Pour batter into the prepared pan and bake for 35 minutes. Frost when cool. To Make Frosting: Blend together 1/8 cup butter or margarine, 3 cups confectioners' sugar, 4 1/2 tablespoons evaporated milk and 1 1/2 teaspoons vanilla extract, stirring slowly until mixture holds its shape. Then beat until very smooth. If necessary, gradually add tiny amounts of evaporated milk to bring to spreading consistency. The cake was great and easy to make. We didn't like the icing, though. Next time we're thinking of using cream cheese or chocolate frosting. Too dry, and tastes like flour. It's moist and tasty, but just a little too sweet. Need to cut down on half portion of sugar. I made the cake according to directions but the icing was missing something so I added 1/2 cup Peanut Butter and I received a lot of compliments from my family. I will make again.